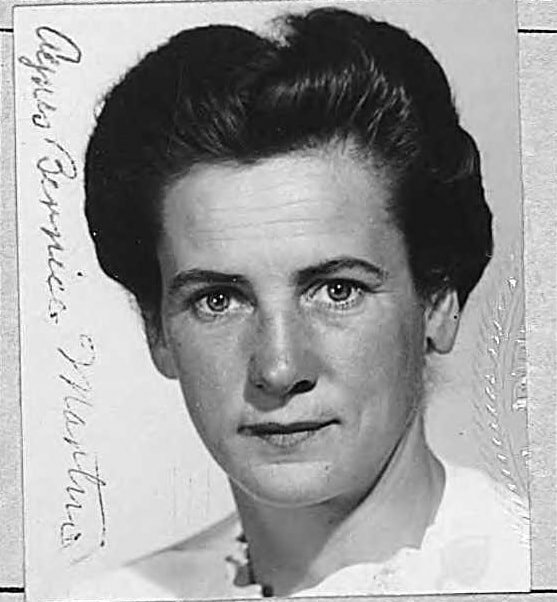 Agnes Bernice Martin was born in 1912 to Scottish Presbyterian farmers in Macklin, Saskatchewan one of four children. From 1919, she grew up in Vancouver. She moved to the United States in 1931 to help her pregnant sister, Mirabell, in Bellingham, Washington. She preferred American higher education and became an American citizen in 1950. Martin studied at Western Washington University College of Education, Bellingham, Washington, prior to receiving her B.A. (1942) from Teachers College, Columbia University. In 1947 she attended the Summer Field School of the University of New Mexico in Taos, New Mexico. After hearing lectures by the Zen Buddhist scholar D. T. Suzuki at Columbia, she became interested in Asian thought, not as a religious discipline, but as a code of ethics, a practical how-to for getting through life. A few years following graduation, Martin matriculated at the University of New Mexico, Albuquerque, where she also taught art courses before returning to Columbia University to earn her M.A. (1952). She moved to New York City in 1957 and lived in a loft in Coenties Slip in lower Manhattan. She left New York City in 1967, disappearing from the art world to live alone. After eighteen months on the road, Martin settled in Cuba, New Mexico (1968-1977), and then Galisteo, New Mexico (1977-1993). She built an adobe home for herself in each location. In 1993 she moved to a retirement residence in Taos, New Mexico, where she lived until her death in 2004.